I recently wrote an article for a national trade magazine featuring the many design aspects of decorative concrete overlay systems. When I finished the piece I was amazed how versatile these materials are in regards to color, texture and patterns. When one considers not only the design aspects but how practical these systems are it is an easy decision to select decorative concrete as your flooring of choice. Sundek decorative coatings are used to solve a host of concrete problems including cracking, discoloration, slip-fall issues, drainage problems, and correct uneven trip-fall hazardous concrete so this solution has a very practical side as well. It is not just pretty face! What finally blew me away was the fact that decorative overlays can be applied in so many situations; interior-exterior, vertical-horizontal, new-old, concrete-masonry, plain or fancy! From the most humble abode to mansions on the hill, Sundek Decorative Concrete Dealers throughout the United States have installed over a million square feet of Sundek decorative concrete coatings on driveways over the years. 1) Increased Curb Appeal – In my forty years of Sundek history, I have always enjoyed receiving comments from happy customers of “how pleased they are with the awesome drive up appeal that Sundek provides” – after all the front of your property is a major announcement point for visitors! 2) Sundek Decorative Concrete Solutions – Each of our Sundek Decorative Concrete Solutions for driveways is durable enough to withstand vehicular traffic yet elegant in a variety of colors, patterns and designs. No matter the type of property you are working on, adding a limestone coating to a concrete driveway can dramatically improve its value. This coating is simple to apply, as it doesn’t require tearing up the existing driveway, and it will look just like limestone, providing all the benefits of natural stone without the high cost or labor time. SunStone from Sundek is perhaps the simplest and highest-quality option to add the appearance of limestone to a concrete surface. Best of all, it is versatile enough to be applied to brick, sheetrock, stucco, walls, foam, or other surfaces as well, so the limestone coating can continue past the driveway regardless of the surface underneath. One of the biggest ways that a limestone-coated concrete driveway improves the property value is by adding to its curb appeal. When someone first looks at a home, they notice the landscaping, the overall exterior appearance of the home, and the condition of the driveway and sidewalks. A driveway that appears to be made of limestone instantly gives the house an upscale appearance as limestone is an expensive and durable material. It is also much more visually appealing than a standard driveway made from a solid piece of concrete without any colors or patterns. Because a limestone coating is a type of concrete overlay, it also improves the durability of the driveway. A driveway with cracks or minor spalling will lead to a lower property value than one that is in perfect shape. That is because surfaces without these imperfections last longer, so future property owners do not have to worry about immediate repairs. Not only does a limestone-coated concrete driveway improve the property value, it does so at a relatively low cost. Since the old driveway doesn’t need to be torn up, there are reduced costs for both labor and supplies, giving property owners the ability to make a small investment and notice large gains in the value of their property. This is especially true when SunStone is installed by trained professionals, as it will be long-lasting and truly look like limestone to the untrained eye. Property owners are constantly looking for easy ways to boost their home’s curb appeal. There are plenty of simple things you can do, but one of the most effective is adding or updating concrete walkways. These walkways may be a part of the landscaping in either the front or backyard or even be sidewalks in areas where they are not normally found. Simply adding concrete walkways will boost the appeal to some extent, but for the best results, you should consider a decorative form of concrete, whether it is stained, stamped, or textured. One of the simplest ways to boost curb appeal by upgrading your concrete walkways is to use stains or dyes. Some of these products are added on top of the concrete surface while others are mixed into the wet cement before pouring to create an integral color. SunColor, for example, is a finish coat that will work on nearly any concrete surface, including textured ones. Another option is to rely on stamped concrete to create any sort of design you want on your concrete walkways. This method of adding to a property’s visual appeal is perfect for those who want to mimic a specific rock pattern. Stamped concrete overlays, like SunStamp, can also be stamped with any design you want. In addition to SunStamp, various other Sundek concrete overlays could significantly boost your home’s curb appeal. SunStone is particularly popular among those who want their concrete walkways to appear to be made of limestone at a fraction of the cost. Classic Texture is a great option if you are concerned about a surface getting slippery or overheating in the sun, such as in the case of walkways leading up to a pool deck. Slippery surfaces are a safety risk, and this is more commonly an issue in garage floors, where rain, snow, and other liquids can be tracked in and increase the risk of sliding around. Whether you are a homeowner looking to make your slippery garage safer or own an auto repair shop with a large garage area, there are some simple solutions to improve safety. There are numerous coatings and overlays you can add to the concrete surface of a garage floor, reducing the risk of people falling and injuring themselves. One of the easiest things to do to make a slippery garage floor safer is to add an anti-slip coating on top. There are several variations of these, but most will add some sort of texture to the flooring. It is also possible to create a coating of your own using anti-skid additives. Certain coloring systems will also reduce the risk of slipping, such as SunFlek, which is available as a surface that is aggressively slip resistant. 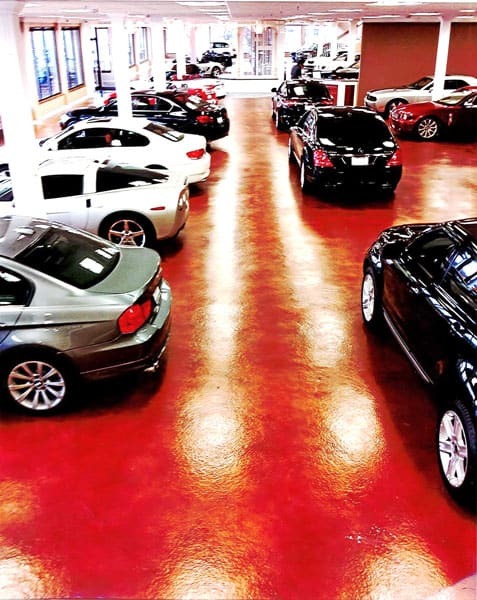 Epoxy sealants can also dramatically improve the safety of slippery garage floors by reducing the risk of slipping. That is because coatings such as SunEpoxy have a small element of natural texture that works to help with this issue. You can further add to the texture with color chips or even quartz beads to improve slip resistance. While adding coatings and sealants to concrete garage floors can reduce their slipperiness, so can adding another layer of concrete in the form of an overlay, provided that you select appropriately. When using this solution, your goal should be to add texture to the floor, as the texture will stop people and objects from sliding around. Simply be sure to select a Sundek overlay and texture pattern that is able to withstand the constant heavy traffic of a garage. This will typically not be a concern due to the high strength of concrete, but it is always a good idea to discuss the options with your contractor before making a decision. All of the above methods for making garage floors slip resistant with Sundek products will be affordable and long lasting. In some cases, however, you need an immediate solution for slippery floors until the coating or overlay can be applied. In these situations, you can consider adding mats or adhesives to strategic locations on the floor. Adhesives may cause mild damage to the garage floor, but this can be easily remedied by applying one of the solutions mentioned above, which will also permanently resolve your safety concerns.